Belgian police stage a raid, in search of suspected muslim fundamentalists linked to the deadly attacks in Paris, in the Brussels suburb of Molenbeek, Nov. 16. 2015. Officials say Belgian national Abdelhamid Abaaoud, said to be currently in Syria, is suspected of leading an Islamic extremist cell in eastern town of Verviers. French officials say they have identified the mastermind behind the terrorist attack in Paris as Belgian national Abdelhamid Abaaoud. Abaaoud is said to be in Syria. Belgium authorities had sought Abaaoud earlier this year for a foiled terror attack on police. Belgium media described Abaaoud then as of Moroccan descent, suspected of leading an Islamic extremist cell in the eastern town of Verviers. French police have made "more than 150 raids" on suspected Islamists across the country, French Prime Minister Manuel Valls said Monday. The raids were carried out early Monday in Toulouse, Grenoble, Jeumont, Lyon and the Parisian suburb of Bobigny, resulting in the detaining of more than 10 people and the seizure of a number of weapons, including a rocket launcher, a Kalashnikov rifle and bulletproof vests. Valls said France has "avoided several attacks," but there could be more "in the coming days, in the coming weeks." The prime minister said he is not trying to scare people but "we're living with and we're going to live for a long time, with this terrorist threat and we need to prepare ourselves for further attacks." 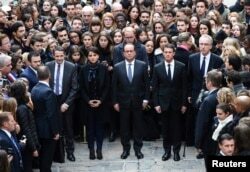 (From L) French Minister for Higher Education and Research Thierry Mandon, French Education Minister Najat Vallaud-Belkacem, French President Francois Hollande and French Prime Minister Manuel Valls observe a minute of silence at the Sorbonne University in Paris to pay tribute to victims of Friday's Paris attacks, France, Nov. 16, 2015. The raids and arrests were made as France held a midday moment of silence to pay homage to the victims of Friday's terrorism attacks which targeted six sites across Paris, killing 129 people and wounding more than 350. The death toll had stood at 132, but was lowered after an apparent counting error. French President Francois Hollande marked the silent remembrance at the Sorbonne. The European Union has asked all its member states to also participate in the silent observation. Officials at NATO headquarters in Brussels will also observe the minute of silence. On Sunday, French fighter jets launched massive airstrikes against the Islamic State group's stronghold of Raqqa, destroying a command post and a training camp. 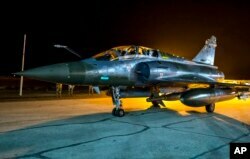 A French military statement said 10 fighter jets were used to drop 20 bombs on the Islamic State (IS) targets. It was France’s biggest strike to date targeting IS in Syria, and it comes after the terrorist group claimed responsibility for the series of attacks in Paris that killed more than 130 people Friday night. Hollande has called Friday’s gun and suicide attacks an "act of war." While authorities believe that there were only eight actual attackers, they think that about 20 people were involved. 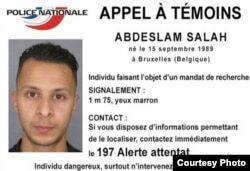 French prosecutors said Monday one suicide bomber has been identified as Samy Amkimour, a 28-year-old Frenchman charged in a terrorism investigation in 2012. He had been placed under judicial supervision, but had disappeared and an international arrest warrant had been issued for him. Prosecutors said three people in Amkimour's family were detained early Monday. Prosecutors said another suicide bomber was found with a Syrian passport with the name Ahmad Al Mohammad, a 25-year-old born in Idlib. The prosecutor's office said the attacker's fingerprint matched someone who passed through Greece in October. Police handout photo of 8th suspect they are searching for in connection with the Friday terror attacks that rocked Paris, France. French police have also released a photo of a suspect who is still at large from the Friday night attack on Paris. Another attacker was identified as Bilal Hafdi of Belgium, who was one of the suicide bombers at the stadium. 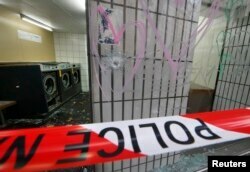 Bullet impacts are seen in the window of a laundromat near the Le Carillon restaurant, one of the attack sites in Paris, Nov. 16, 2015. More details are also emerging about another assailant, Frenchman Omar Ismael Mostefai. He was the first terrorist identified in the attack, lived outside Paris and apparently tipped into radical Islam in 2010. French police questioned close relatives of Mostefai Sunday. Hundreds of Parisians who had gathered to observe vigils at the Place de la République and Carillion Café, one of the places that was attacked, panicked Sunday when sudden noises sent them running. The Associated Press reports that the crowd was spooked by firecrackers. The Place de la République was the scene of massive peace demonstrations after January’s Paris attacks.